Recent events in Kyrgyzstan highlight two perennial political questions. How does a country rid itself of an unwanted, incompetent, or abusive leader? What is to be done with that individual once removed from power? Most national chief executives do not leave office voluntarily. Usually a variety of institutionalized mechanisms – electoral defeat, loss of parliamentary support, or term limits – eventually bring about the desired result. When these processes do not exist, illegal or extralegal means must be employed to effect a change in leadership. Such is the case with Kyrgyzstan’s President Kurmanbek Bakiyev. Anti-government protests resulting in the deaths of at least 80 people forced Bakiyev to flee the capitol to his home area in the south where he attempted to rally supporters. Failing in that effort, he took refuge first in Kazakhstan and then in Belarus. The terms under which he left the country are confusing and subject to conflicting interpretations. The new transitional government insisted on his resignation, which he agreed to on the condition of a security guarantee for himself and his family. Officials appeared to grant that request, but the exact nature of the understanding remains unclear. Bakiyev has now withdrawn his resignation. 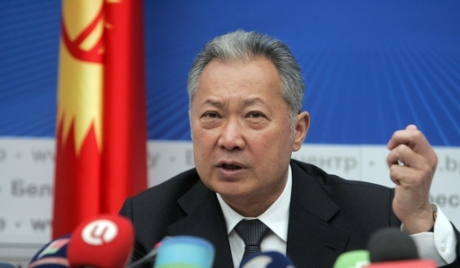 Kyrgyzstan has brought charges against him and family members and is seeking his extradition. The new leadership must now attempt to rebuild the political process while also dealing with these legal and diplomatic issues. Whether that effort will be motivated by a sense of justice or a desire for revenge remains to be seen. Chief executives who abuse their power and persecute opponents fear the loss of their position out of a real concern that once out of office they will be treated as they treated others. The policy issue is to find a way to make it easier for them to retire from the political arena. The solution lies in permitting immediate exile and ensuring a limited amnesty. Immediate exile for the ex-leader and his family has two advantages. First, he knows that his physical security will not be jeopardized. That alone would encourage the exit of many dysfunctional leaders. Second, granting a request for exile would free the new government from the burden of having to decide what to do with the ousted executive and allow it to focus on the transition and governing. Limited amnesty is not a pardon for crimes committed while in office; instead it means delaying charging and prosecuting the former head of government until he has left the country. He should be given incentives to resign and leave immediately. The individual can always be charged, tried, and perhaps convicted, in absentia for offenses associated with his time in power, but the new leadership should not attempt extradition for a trial and punishment. That approach would violate the guarantees which eased the accused out of power. A policy of amnesty and exile clearly does not serve the interests of justice when serious crimes have been committed. It does, however, recognize utilitarian interests which should over-ride all others. Removing the offending leader as quickly and expeditiously as possible sets the stage for a smooth transition to a new government and for avoiding further violence and disruption. These must be the primary objectives. If the new regime knows the ex-chief executive is out of its reach, it can concentrate on reconstruction and reconciliation rather than popular demands for revenge. If the former leader retains some supporters within the country, their interests may be assuaged by the knowledge that he is safely in exile. That assurance may diminish opposition to the new government. Providing these two security guarantees is not easy when allegations of serious offenses are involved. However, the historical and legal record of the previous administration can always be established later and does not require the presence of a defendant. A policy of limited amnesty and exile provides a reasonable path out of one of the most contentious situations governments must confront. Kyrgyzstan is not the first country, nor will it be the last, where this approach could be applied with good effect. Donn M. Kurtz II received his Ph. D. from Tulane University and taught political science at the University of Louisiana at Lafayette from 1969 until his retirement in 2007. He lives near Grand Coteau, Louisiana.